In May-June of this year I walked the Camino Francés to Santiago de Compostela. During my journey I undertook a daily spiritual practice from the Sufi tradition as a walking meditation. In a post entitled Momentum from my Camino blog The Essential Way, I wrote a bit about wazifa chanting practice, invoking any of the 99 Beautiful Names of Allah, as a spiritual take-along due to its deepening effect on me. I can’t begin to tell you how important the practice turned out to be during this time. I chose specific wazifas that guided me and shaped focus and experience. When my body was having difficulty, they eased my pain and got me up mountains. When the day on the trail became long and my mind grew bored, they brought my awareness to presence and the beauty surrounding me. When I wrestled with uncertainty or issues, they helped usher in clarity. Prior to embarking I told two Sufi friends about my intent for wazifa practice. 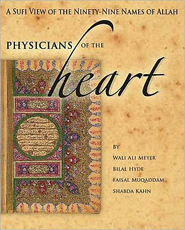 Each mentioned a different book as a potential guide: Physicians of the Heart: A Sufi View of the Ninety-Nine Names of Allah and The Sufi Book of Life: 99 Pathways of the Heart for the Modern Dervish. I didn’t know either existed and was happy to learn there were e-book versions. When you’re carrying a backpack with your bare necessities, every ounce counts. Since they added no additional weight, I downloaded both. They proved to be valuable by providing different lenses, sorting perspectives on the same spiritual tenets based on the authors’ backgrounds and interests. All are well-known living Sufi mystics and leaders. Pir Shabda Kahn has been the spiritual lineage holder of the Sufi Ruhaniat International since 2001. In the introduction to Physicians of the Heart he writes about receiving inner direction, shortly after accepting the appointment, to bring forth an English language guidebook on the Beautiful Names to accompany study and practice. He invited three other Sufi teachers to join him in this spiritual work. Faisal Muqaddam is a founder of the Diamond Approach, merging psychology of the human spirit with Sufism. Imam Bilal Hyde is an Arabic and Qur’anic scholar. Murshid Wali Ali Meyer is the head of the esoteric school of the Ruhaniat. Aside from his work as lineage holder, Shabda is a recognized master of raga—Indian classical vocal music—and accomplished musician. This esteemed circle gathered for ten years to undertake deep wazifa study with intent toward producing a spiritual guidebook offering elements to take present-day practitioners to progressive levels of immersion. For several years beginning in the late ‘90s I attended Sufi retreats featuring Shabda as teacher where he also led wazifa practice and Dances of Universal Peace. In ’98 I went to India with him to study introductory raga. I was already predisposed to embrace Physicians of the Heart without yet laying eyes on the first page. There are many things I appreciate about its contents. It is easy to see the influence of each contributor’s knowledge, which brings a holistic approach and depth that had been lacking in my own awareness in wazifa practice, even though an effect was still there. I am particularly drawn to their distinction of select wazifas working together along a common theme. For instance, already knowing I was going to work with Ya Fattah I was shown to work with two additional wazifas, encompassing a natural, believable progression: Ya Wahhab (O, Giver of Gifts) to Ya Razzaq (O, Provider) to Ya Fattah (O, Opener). This metaphor is given to frame how they evolve one to the other. It resonated with me. First, a belief in abundance is necessary: There is enough for all. Second, the opportunity accepted, evidenced through work done to lay the foundation. Finally, there’s fruition of all the groundwork, consistently accomplished, so it stretches ahead to be met with each footfall. Should a practitioner encounter inner difficulties working with a wazifa, direction is given toward other wazifas that serve to help transmute limiting beliefs and patterns. 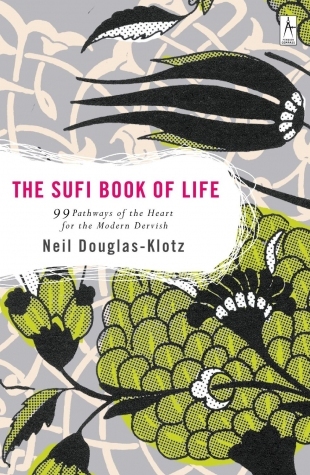 The content of the book covers a lot of ground: Arabic linguistic roots, pronunciation—even connecting to an audio version online—psychological components, Sufi teachings, overview and in-depth explanation of each wazifa. It is a reference for Sufi practitioners. However, you don’t have to be one to glean value and guidance. I especially appreciate the way the book is organized. I may not be interested in the sound code on which there’s a detailed, technical chapter, but I can quickly find a wazifa, that draws me by the brief description of each one. Then go to the page where that one is discussed in depth and allow the knowledge to permeate my practice in ways I hadn’t foreseen. Here’s a video treat: the authors speaking about their meetings and practice over ten years that culminated in this book. Available via the book’s website or Amazon. I know Saadi Shakur Chishti—Neil Douglas-Klotz—through his books. He is perhaps best known for his translation of words attributed to Jesus from his native Aramaic language. In The Hidden Gospel Saadi compares the King James Version to the translated Aramaic of Jesus’ time. Dry, punitive language is transformed to lyrical prose that holds beauty and hope. In this latter version I can not only engage—but also immerse my soul. I pulled an example to give you an idea. Translated Aramaic: Those who surrender to Unity, bowing to it in utmost adoration, must do so in breath and harmony, like the sense of right direction that drives the universal winds. Given that his approach and translations in The Hidden Gospel transformed Jesus—to me—into a believable, approachable, forgiving teacher I was also predisposed to embrace The Sufi Book of Life. In the introduction Saadi encourages the reader to meander through the book and notice which wazifas draw you…and work with those. This is easy to do because the chapter titles are in English illustrating a sense of what is sought or produced. Below the title is the wazifa in Arabic and guidance as to what is likely drawing you to that specific one. In the following paragraphs he lays the foundation in poetic language. Then draws upon Sufi teaching stories and poetry to embellish our understanding. When I read such writing I automatically find myself riding the Breath of Life to that inner place I’m being directed. It goes in a different way. The practice has already begun. To return to my chosen wazifa Ya Fattah, the descriptive chapter title says Opening to Unity’s Breath. Guidance indicates I chose that one to: …take the opportunity to experience the Sacred Unity opening you to your destiny. He proceeds to draw from Sufi teachings and the sayings of Muhammad to bring more depth: If they remember me in their heart, I remember them within my heart. If they come toward me walking, I come toward them running. There’s a section entitled Roots and Branches that offers the traditional translations and variations of the word and sound roots. Each chapter ends with a suggested meditation offering a physical centering point, progression using the breath, ending with a question to consider through the process. Since I use breath and energy in my daily meditations, this is naturally appealing to me. I found each of these guidebooks to be beautifully powerful in their own way. They can be used separately. But I found them particularly useful as companion books for practice. How clever to be able to download these books to carry within what you are already including in your essentials. Truly the mark of a contemporary pilgrim. I have been casually living with The Sufi Book of Life for some time now, opening to a new page when it comes to me to do so and not in any particular order. I appreciate that most of the teachings are on two pages only, in a double page layout easily viewed at one time (physical book version) with consistent parts of the teachings placed visually, one offering like the other. The one open now is “51 The Truth in Each Moment” “When you are drawn on this pathway, take the opportunity to make space for the amount of divine life energy you are able to embody at this moment, and experience this as your “truth” in this moment.” There are thoughts following and words from Rumi, a poem to illustrate, a section called “Roots and Branches” for historical background and it ends with a suggestion for meditation. It is a tiny book filled with a lifetime of teachings. How splendid that it was one of your companions Carla. Janet, for sure when you open yourself to intent…no telling what can appear! I’m glad to know the book also came into your hands.